FOUR IN 10 people think the Freedom of Dublin award given to Aung Sang Suu Kyi should be taken back. In a poll of more than 1,000 adults carried out by Ámarach Research for Claire Byrne Live, 42% of people said they think the Myanmar leader’s award should be rescinded, 11% disagreed and 47% were unsure. A number of Dublin city councillors previously told TheJournal.ie they believe the Nobel Peace Prize winner, who spent many years under house arrest in military-run Myanmar (formerly Burma), should have her award taken back. Their calls come amid criticism of Suu Kyi’s response to the plight of the Rohingya Muslim minority in her country. Tens of thousands of people have been fleeing across the border into nearby Bangladesh to escape ethnic violence. At least 1,000 people are known to have been killed. Survivors of the violence have said children have been beheaded and men burnt alive. Suu Kyi had been criticised for failing to speak up about crisis. Earlier this month she broke her silence on the issue to allege that a “huge iceberg of misinformation” was distorting the picture of what was happening. To date, more than 425,000 people have signed a petition calling for Suu Kyi’s Nobel Peace Prize to be taken back. She was awarded the Freedom of Dublin in 2000, but only received it in 2012 as she was under house arrest at the time. Email “Four in 10 people think Suu Kyi's Freedom of Dublin award should be taken back”. 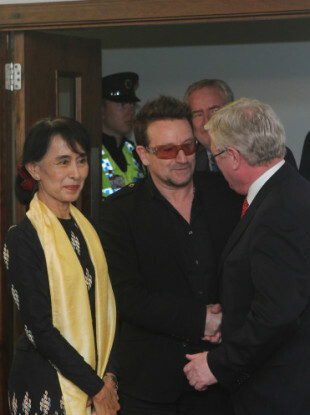 Feedback on “Four in 10 people think Suu Kyi's Freedom of Dublin award should be taken back”.